In the Dreamtime, winds blew from all directions carrying the seed of this sweet black berry over the land. The first Anwekety then grew, bore fruit and dropped more seeds. Winds blew these seeds all over the Dreaming lands. 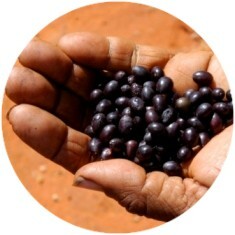 The conkerberry is a sweet black berry favoured by desert Aboriginals. The berries can be eaten straight off the tree, or collected as dry fallen berries and reconstituted in water. The plant of the conkerberry is a tangled, spiny shrub that can grow up to 2m high and bares medicinal properties. The orange inner bark from the roots can be soaked in water and the resultant solutions can be used as a medicinal wash. This is particularly favoured for skin and eye conditions. The thorns on the shrub can be used to cure warts. Artists who paint the Conkerberry Dreaming include Kathleen Ngale, Polly Ngale, Angelina Ngale, Elizabeth Mpetyane and Glady Kemarre.